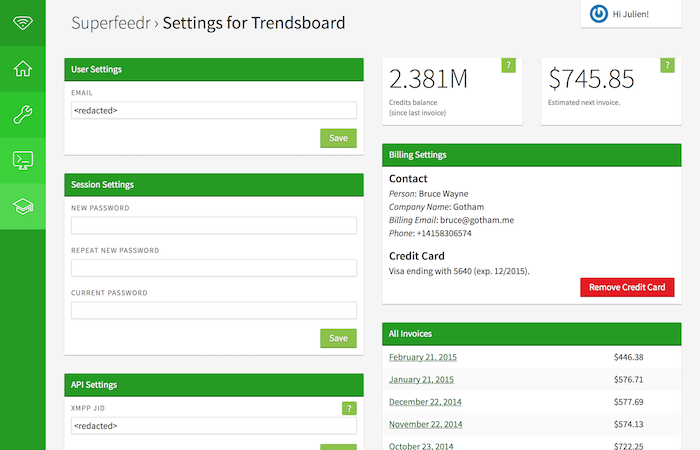 Filter through the latest updates with realtime data from around the web. Build real-time search applications using data from milions of websites. You can include or exclude terms, pick exact or fuzzy match, filter by languages, and more! We work hard to be the first to learn about new data on the open web, and notify you of new matches in real-time via webhooks. We track your search queries across millions of feeds and we include metadata to help you filter by popularity, spaminess, and other key factors. Before switching to Superfeedr we were running our own complicated code to handle polling, fetching and normalization - and constantly finding edge cases and feeds broken in new ways. Superfeedr saves us from reinventing the wheel and frees us up to focus on what we're good at. 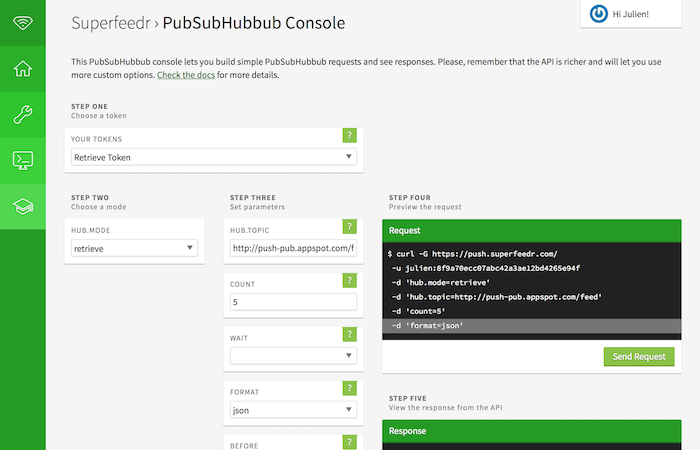 Our API console make it easy to visually create and execute requests without leaving your browser. Perfect for quick tests and fast learning. 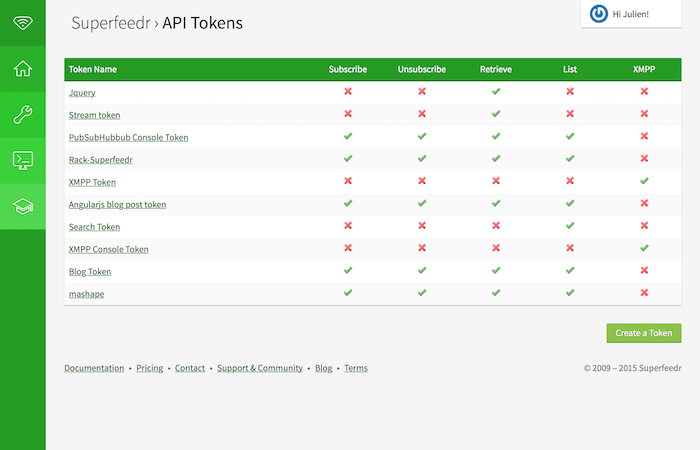 Superfeedr's tracker pricing is simple: pay just $2.00 for each tracking feed you subscribe to. Each tracking feed comes with 2,000 monthly notifications included. After that, our regular subscriber pricing table applies. How many tracking feeds will you need? 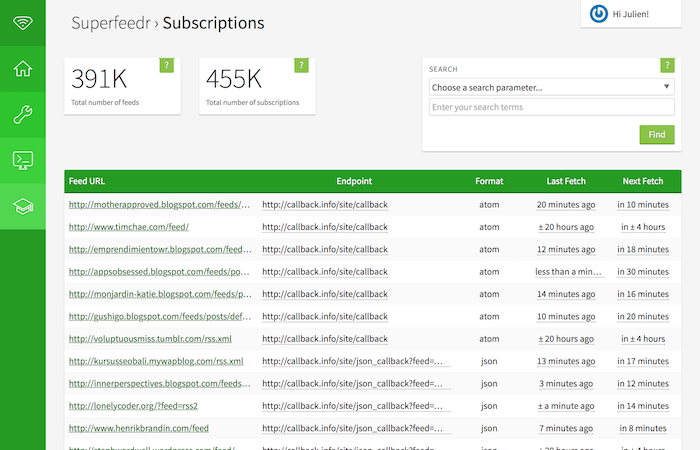 Superfeedr helps you track content from the whole web.